Building a brand is a lot like steering a ship. You’ve got to chart your course, correct direction where necessary and make sure your crew is doing all it can to keep making headway. So, how do you navigate your brand through the treacherous waters of consumer perception, social word of mouth and short attention spans? You find your North Star. North Star marketing operates on the idea that a brand can make one strong claim and own it. Yes, there are many excellent things about your brand and product. But it’s important to resist the temptation to present your brand as a panacea. The average consumer has a very short attention span and a host of brands competing for that attention. And, while you may spend most of your day thinking about your brand, your consumer likely does not. That’s why North Star marketing tactics can be so powerful. Take a moment to think about the associations you have with some of the world’s most famous brands. If you hear the name “Enterprise,” you probably think “We’ll pick you up,” right? That’s because their North Star is customer service. Everything they do ladders up to that, and their differentiation point of picking up consumers is the personification of that brand promise. What about Nike? “Just do it.” That’s because their North Star is empowerment. Ford is tough. Apple is sleek. Coke is happiness. Each of these brands has one key idea that they hang their hat on. Then they work to enhance that one single message with everything they do, in every facet of their brand. So, when it’s time to build, solidify or reinvent your brand, ask yourself what your guiding principle is. 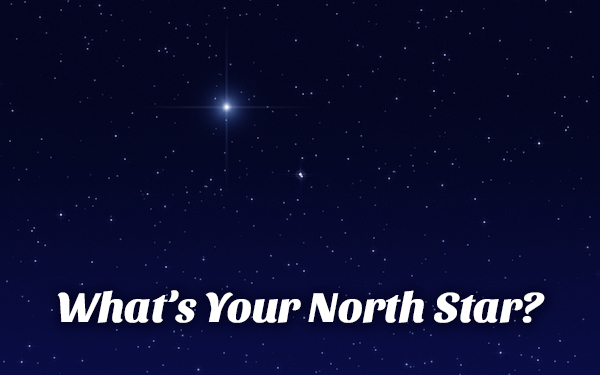 Once you find your North Star, it becomes a lot easier to make good decisions about how you should market and talk about your company. Need help finding your guiding light? The Current360 Brand Discovery Process can do just that. Get in touch and let’s build something great.